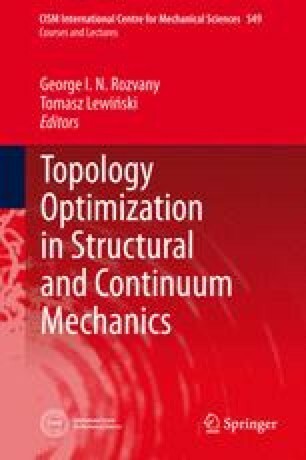 This paper presents a brief introduction to topological design optimization, and together with five sequential papers gives an overview of the application of this rather novel method to problems of design of linearly elastic continuum-type structures against vibration and noise. The objective of such problems is often to drive the structural eigenfrequencies of vibration as far away as possible from a prescribed external excitation frequency - or band of excitation frequencies - in order to avoid resonance phenomena with high vibration and noise levels. This objective may, e.g., be achieved by (i) maximizing the fundamental eigenfrequency of the structure, (ii) maximizing the distance (gap) between two consecutive eigenfrequencies, (iii) maximizing the dynamic stiffness of the structure subject to forced vibration, or by (iv) minimizing the sound power flow radiated from the structural surface into an acoustic medium. The mathematical formulations of these optimization problems and several illustrative examples are presented in this series of papers.